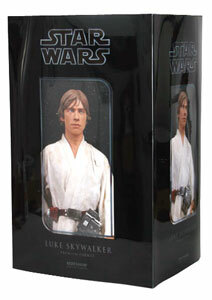 Description Of Item: The 17" Luke Skywalker figure is the most film-accurate representation of the character ever produced. Sideshow's skilled artists have used their many talents (after studying reference from Lucasfilm's vast archives) in order to bring you a Luke Skywalker collectible that's more than a figure, it's a work of art. This museum quality mixed-media figure is composed of polystone, metal, and expertly tailored clothing, and captures the iconic moment where Luke stares off into the sunsets of Tatooine's twin suns, wondering how he might ever escape from the farm for adventures in the stars.